Watches are for telling time, but this is different. 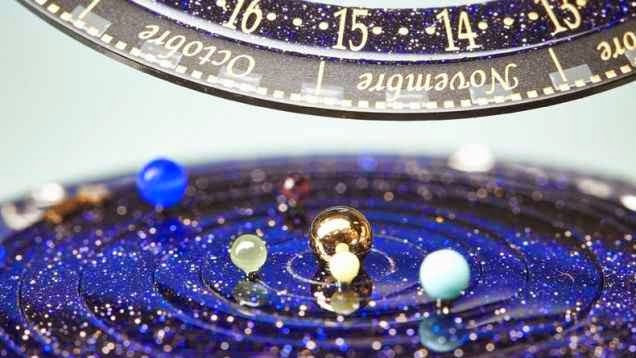 Planetarium watch steps it up by following the courses of planets in the solar system. Mercury through Saturn move around the dial sketching the real-time indication of planets round the sun while a comet marks the more practical time of day. Practically speaking, I don't need a watch to tell me the position of the planets or the phase of the moon. But visually and sensitively speaking, this astronomy watch is a facet of geek-chic that has me completely entranced with its stylish complexity. 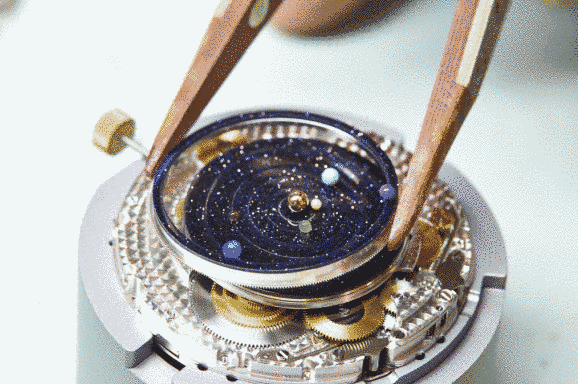 French jewelry, watch, and perfume company Van Cleef & Arpels uncovers a $330,000 watch that tracks the revolution of the six planets observable from Earth in real-time. This superfluity thing, called the Midnight Planetarium, is a love message to ancient astronomy.